24th February, 2016, New Delhi: Fortis Healthcare as part of its efforts to strengthen its core value of patient-centric health services became the first private Indian healthcare chain to monitor and publish clinical outcome data for major Cardiology procedures, based on global norms specified by the International Consortium for Health Outcomes Measurement (ICHOM). Mr. Bhavdeep Singh added, “This is a great position to occupy. Patients need to be aware of the results and implications of the procedures they are considering. By publicly declaring salient outcome data that is based on ICHOM norms Fortis has empowered its patients and taken a giant leap amongst all healthcare providers in delivering quality care with safety. " Dr. Ashok Seth, Chairman, Fortis Escorts Heart Institute said, “This is a huge step towards institutional accountability and doing the best for your patients. The analysis and audit of results in an internationally standardized manner helps us to deliver the best practices in angioplasty and bypass surgery and provides a benchmark to know what we are doing well and what we can do better. It is also the litmus test in our patients about the openness we endeavor to maintain for patients to take informed decisions.” Most importantly our results are audited and open to scrutiny. While this may be a first for India, the future of high quality healthcare delivery over the next year is going to be based on such initiatives, which the patient will need and demand. Fortis Escorts Heart Institute (FEHI) as part of the ICHOM Coronary Artery Disease Steering Committee became the first Asian hospital to implement the ICHOM Coronary Artery Disease Set for monitoring clinical quality, the incidence of post-operative complications (kidney failure, heart attack, wound infections) in patients undergoing Coronary Artery Bypass Graft (CABG) and Percutaneous Coronary Intervention (PCI). Dr. Bishnu Panigrahi, Head - Medical Strategy and Operations Group, Fortis Healthcare Ltd. said, “There is a lot of rigour in the process. Following the adoption of the ICHOM methodology, it takes nearly two to three years before stable data becomes available for analysis. 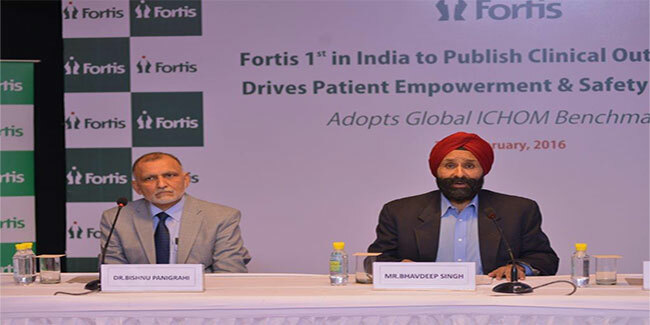 Having had a head-start in this space, Fortis is now ready to ramp up and will soon be adding more hospitals and specialties that include the Fortis Memorial Research Institute and Fortis hospitals at Mohali, Mulund and Bangalore for Coronary Artery Disease (CAD). Later this year, Fortis would post outcomes for Kidney Transplant, as well. Fortis has been a part of the ICHOM Working Group that developed the standard sets for Coronary Artery Disease (CAD). These were rolled out in November’2013 by Prof. Michael Porter at the Harvard Business School, Boston. Since 2014, Fortis is an integral member of the Steering Committee for Coronary Artery Disease (CAD) at ICHOM. With the availability of relevant hard data Hospitals can continuously measure and improve their clinical outcomes. Equally, the data provides valid and comparable yardsticks with which prospective patients can evaluate their options before making informed choices. Fortis has taken the lead in this patient friendly endeavor and is the first to display on its website, validated results that are open to public scrutiny. This initiative reinforces organizational accountability and transparency towards its patients and stakeholders. More importantly, it places Fortis squarely among the world’s best hospitals, giving patients, especially international patients, an opportunity to make an informed choice, further boosting the prospects of medical care beyond borders. FEHI and VitalHealth™, use the proprietary Quest Manager software for reporting clinical outcomes ensuring that the reporting methodology at FEHI conforms to the highest international norms and standards set by ICHOM. It uniquely features Patient-Reported Outcome Measures (PROMs) adding greater objectivity by including the voice of the consumer to the entire initiative. The International Consortium for Health Outcomes Measurements (ICHOM) is a non-profit organization founded by three esteemed institutions – the Harvard Business School, The Boston Consulting group and Karolinska Institute. The mission of the organization is to standardize sets of outcomes that reflect what matters to most people with individual medical conditions; to support benchmarking which can take place when everyone is measuring the same things on the same platform; complete transparency to patients and clinicians to set common standards to compare with other clinicians. The results then drive adoption and reporting of these measures worldwide. India can benefit from this tremendously to improve its quality of healthcare and also showcase to the world that it adheres to global standards. Clinical Outcomes are the globally agreed upon, evidence based measurable changes in health or quality of life resulting from patient care. Reporting of outcomes and its continuous monitoring provides an opportunity for both assessing and improving quality of patient care. A user friendly reporting and monitoring structure leads to greater understanding of clinical outcomes, thereby facilitating rational decision making by patients. Fortis Healthcare Limited is a leading integrated healthcare delivery service provider in India. The healthcare verticals of the company primarily comprise hospitals, diagnostics and day care specialty facilities. Currently, the company operates its healthcare delivery services in India, Dubai, Mauritius and Sri Lanka with 54 healthcare facilities (including projects under development), approximately 10,000 potential beds and 306 diagnostic centres.